Editor's Note: Lia D. ('17) wrote this lab report for her AT Chemistry class in which she experimented with copper. The goal of this lab was to determine the oxidation state of copper when reacting in a single-replacement reaction with elemental copper and a silver nitrate solution. Silver nitrate can pose serious safety hazards. If inhaled, it can cause a sore, burning throat, coughing, and even nausea, headache, and dizziness. Additionally, silver nitrate can cause pain, redness, if exposed to skin, and even a loss of vision if it comes into contact with your eyes. In order to prevent these hazards, it is important to be sure that the exhaust fan is on, and gloves, goggles, and a lab coat should be worn at all times. oxidized from 0 to +1, and silver is reduced from +1 to 0. B. For Cu (II): When solid copper is added to an aqueous solution of silver nitrate, copper is oxidized from 0 to +2, and silver is reduced from +1 to 0. In order to experimentally establish the oxidation state of copper when reacting in a single replacement reaction with aqueous silver nitrate, we started out with 0.824 grams (0.0130 moles) of solid copper, and 1.597 grams (0.009401 moles) of solid silver nitrate. We purposely made sure that we had excess copper, as it allowed us to measure how much copper we started with and ended with, the difference between the initial and the final masses, and therefore how much copper reacted over the course of the experiment. (Additionally, it is important to note that when designing our experiment we decided to use copper ribbon instead of wire so that it would be easier to remove in the end). Furthermore, by calculating how much solid silver we had left, we were able to figure out how much of the silver nitrate reacted (because two moles of silver nitrate reacted for every two moles of silver produced). The mass of reacted copper and precipitated silver were each converted to moles, and we were then able to compare the molar ratios of the reacted copper and the produced silver. Our thought process behind our experimental design was that if we produced double the amount of moles of silver than moles of reacted copper, then the oxidation state of copper would be 2+. On the other hand, if we calculated equal amounts of moles of precipitated silver to reated copper, then the oxidation state of copper would be 1+. If a gram of NaCl were to be dumped into the beaker in the middle of the reaction, the reaction between copper and the silver nitrate would halt, as sodium is far more reactive than copper. This would mean that the left over silver nitrate solution, which has not already reacted with the copper, would dissociate, and the silver would associate with the chloride, and the sodium would associate with the nitrate. In the end, we would have had less precipitated silver than we would’ve had if the spill hadn’t taken place. Additionally, instead of only having solid unreacted copper and solid precipitated silver, we would also have precipitated silver chloride. After the copper wire has been removed, it would be very hard to separate the solid silver chloride from the solid silver, making it nearly impossible to take the mass of only the silver alone. In the end, the failure to be able to record the mass of silver would result in our not being able to determine the molar ratio of reacted copper to silver precipitate, and ultimately not be able to establish the oxidation state of copper. If we were to carry out a similar reaction using a single replacement reaction with silver nitrate, iron would be the most appropriate metal to use instead of copper. First of all, gold would not react with the silver nitrate solution, as it is less reactive than silver. On the other hand, both aluminum and iron are more reactive than silver, and would therefore react with the silver nitrate. The key difference between aluminum and iron, though, is that aluminum only has one possible oxidation state (3+), while iron has three possible oxidation states (2,3, and 6). Consequently, it wouldn’t make sense to carry out a lab designed around establishing the oxidation state of aluminum, if there is only one possible oxidation state. The nitric acid helps to speed up the reaction between copper and silver nitrate, because it offers an alternative way for the reaction to happen with a lower activation energy. More specifically, the nitric acid donates a hydrogen proton, which ends up taking one of copper’s two electrons. This then causes copper to have a positive charge and become attracted to the negatively charged nitrate (that is associated in solution with the silver). If the nitric acid wasn’t added, the reaction would still take place, but it would take much much longer, as the copper, which doesn’t have any charge, wouldn’t readily be attracted to the nitrate. In the end, we were able to successfully confirm that that oxidation state of copper, when reacting in a single-replacement reaction, is 2+. When comparing the moles of precipitated silver, to the moles of the excess copper that were used in the reaction, we found that there were 2.33 moles of silver per 1 mole of copper. This 2.33:1 ratio is fairly close to the 2:1 ratio that we had anticipated, and the small deviation of only 16.5 percent error suggests that were were in fact two moles of silver per mole of copper (II) nitrate. It is important to note, though, that while our data is conclusive enough to establish that copper’s oxidation state is 2+, we did only end up producing 86.2% percent of the silver we theoretically should’ve produced. While it may seem impossible that our reaction precipitated less silver than it theoretically should have, but also yielded a ratio of moles of produced silver to moles of reacted copper that is larger than the theoretical 2:1 ratio, this discrepant and contradictory data can be explained by a number of errors inherent in our experimental design. First of all, one reason why our reaction could've precipitated 13.8% less silver than it theoretically should have is because we might not have actually massed all of the produced silver. While we did try to scrape all of the possible silver that was coating the ribbon, one of the unavoidable downsides of working with excess copper is that when we took the copper out, it was technically still coated in silver nitrate solution, allowing the reaction to continue outside of the beaker. This meant that the copper still continued to form a silver coating while it was set to dry, and our mass of the decanted silver didn’t account for that extra bit of mass. In order to avoid this source of error, we could edit our procedure so that it includes a step on washing the leftover copper ribbon with distilled water before putting it into the drying oven. This would quench the reaction, and would allow us to successfully scrape off any left over silver coating without more appearing right in its wake. Additionally, we only ended up reacting 74.0% of the copper that should’ve theoretically reacted. This low percentage and low mass of reacted copper, are due to a number of inherent flaws in our experiment, and ended up skewing the molar ratio of reacted copper to precipitate silver. As previously mentioned, when it came time to take the remaining copper ribbon out of the silver nitrate solution, no matter how hard we scrapped, there still was a good amount of silver coating the copper (not to mention the silver that continued to form). Additionally, after we dried the copper, we noticed that the copper had a greenish coating on it, signifying that the copper was most likely oxidized. 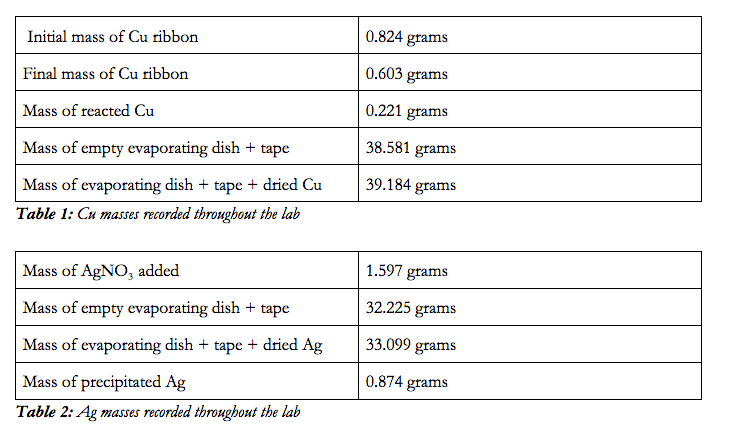 Both the oxidation of the copper, coupled with the amount of silver that was still stuck on the ribbon ended up increasing the mass of the recovered copper. In the end, this meant that we were subtracting a larger number from the initial mass of copper, and ended up getting a smaller number of moles of reacted copper than we should have. Moving forward, if we wanted to eliminate these previously mentioned sources of error that increased the copper’s final mass, we could edit our procedure to include a step in which we the copper ribbon is dried with a paper towel, to not only reduce the oxidation, but to also lightly rub off any remaining silver coating. It is almost important to note that it is virtually impossible to prevent all oxidation on the copper, so in the future it would be wise to research or come up with an alternative method to drying the copper ribbon instead of using the drying over. Lastly, another source of error that was inherent in the design of our lab was the small scale of our reaction. Since our experiment called for the use of such small quantities of each of the reactants, such as 1.597 grams of silver nitrate or 0.824 grams of copper, the effects of each of the previously mentioned errors were magnified. For instance, if we ended up losing 0.1 grams of precipitated silver because it was stuck to the copper ribbon, and we should’ve had 1.0 grams of silver to begin with, that would be a 10 percent difference. On the other hand, though, if we lost the same amount of silver but had 5 grams to begin with, it would only be a 2 percent difference. When working with such small masses the margin of error tends to be inevitably larger. In order to increase the precision of our results in the future, it would be extremely beneficial to design our experiment with a scaled up reaction. Did We Strike It Rich? As of right now, the current market value of silver is 55 cents per troy gram, and 17 dollars and 6 cents per troy ounce. According to the calculations attached, the total value of the 0.874 grams of silver that we produced in the lab is only 48 cents!